A quick “housekeeping” item: I typically make new posts on Friday night (after market close) or Saturday. IF there is something very compelling I may do a short intra-week post, so don’t expect posts to change until the weekend. The week was calm until Thursday when all heck broke loose; big down day on high volume (a.k.a. selling). What caused this? I’m not 100% sure though there have been a number of well-known companys in Tech and Consumer Goods that, while having good earnings last quarter, were giving “negative guidance” for the 4th quarter (i.e. “we expect to do as well next quarter”). But was all “made right” on Friday with the better than expected jobs number? Price wise, pretty much, but volume was not as high as Thursday. I’m thinking more than a few don’t want to hold into the weekend and prefer to see what happens next week. Me too. Could this price structure be Distribution or is it just a pause for Re-Accumulation? Well in the long-term we have not broken that lower channel and we were due for a soft spot at the top end here, so the major trend is intact. We’ll need to see some follow through next week to provide an “all clear”. I’m feeling that we could head lower though; just a gut feel. A test of the previous highs on low volume would be a danger flag. 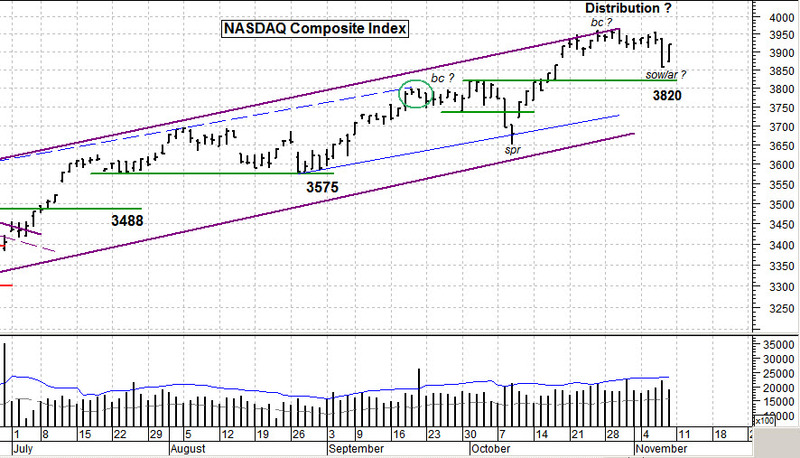 One thing I see is that we’ve lost leadership in small cap stocks and the NASDAQ Composite Index. They have been leading this rally for over a year now. Many of my growth stocks took major hits this week; they were getting soft before that. I’m still concerned about how this market will react to any negative news, it’s vonerable now. I’m still watching that 3820 level to see what happens there. Does it bounce or cut through, and on what volume? That will tell us something right there. I’ve got a lot on my plate this weekend, switching over to a new computer running Windows 8. Much to do and learn, I’d best be going. Have a good week. ………………. Tom ………………..